*CASE ONLY--MULTI-TOOLS AND FLASHLIGHT NOT INCLUDED! 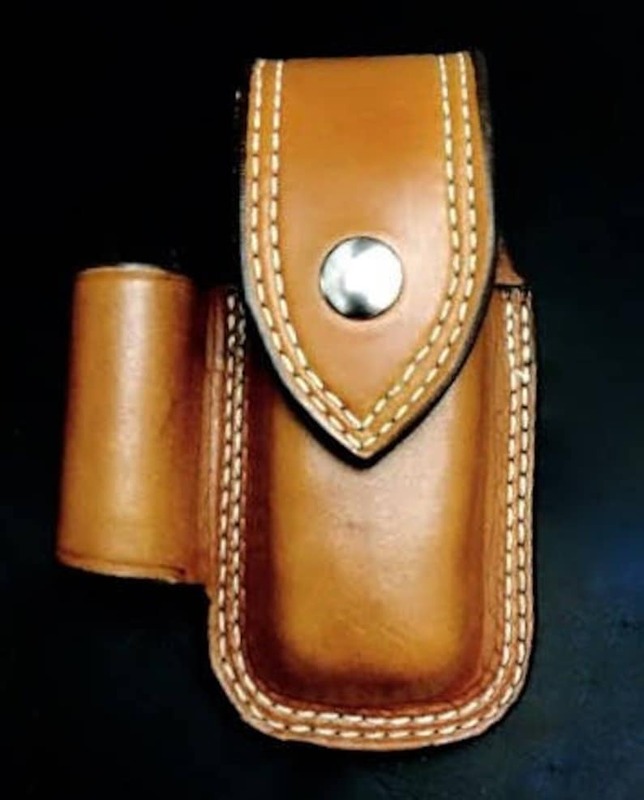 This product is a case/sheath for your favorite multi-tool with a loop built in for a flashlight. - Made from saddle leather in a saddle shop. - Fits Leather belt loop up to 2" belt. This product is built to ensure that your multi-tool and flashlight is secure in its case. *PLEASE NOTE IN YOUR ORDER AT CHECKOUT WHICH TOOL AND FLASHLIGHT YOUR CASE IS FOR! ALSO PLEASE NOTE WHETHER YOU WOULD LIKE A PLAIN FLAP OR A BASKETWEAVE FLAP!! Nice workmanship, quality materials. Shipped quickly considering it was ordered during the holidays. Beautiful construction. Fits multi-tool and flashlight perfectly. Would absolutely buy from Nay again.